The 30-year-old King of Bhutan, the youngest monarch of the world's youngest democracy, is currently on an official visit to India. The US and England-educated King, Jigme Khesar Namgyal Wangchuck, is already being described by the Bhutanese as the "people's king". Impressive by any standard, he has traveled far and wide in his country on foot and on bicycle, and stayed in people's homes, and as he himself put it, cooked for them. Last week I was in Bhutan with a group of women journalists, who went there under the aegis of the Indian Women's Press Corps, and had the opportunity to call on the King, and to get insights into his thinking and vision for his country. In an hou r long chat with us in the magnificent throne room in his office in Thimpu, where he was coronated two years ago, the King spoke candidly on a host of subjects, including the future of Indo-Bhutan relations, the Gross National Happiness that his country has opted for as a yardstick of development, the influence on him of his father, and even on his favourite Indian dishes, and the Bollywood stars he likes. 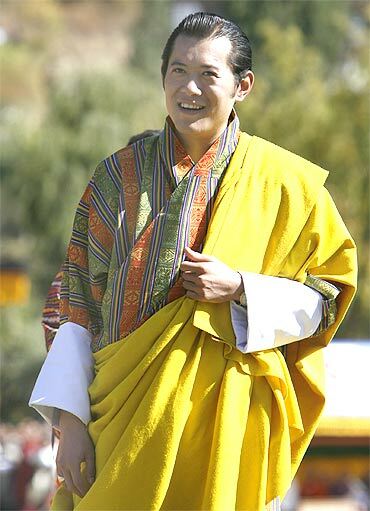 While people used to come to see his father, the fourth King, Jigme Singhye Wangchuck, who, sensing the winds blowing in the region, 'preempted history' and abdicated in favour of his son in 2006, paving the way for a constitutional monarchy in Bhutan and a democratic government, the fifth King is known to go out to his people. The day after we met him -- he had spoken about travelling to different parts of his county on bicycle -- we actually saw him cycling up the hill at a height of 10,000 feet on his way to Punakha valley. There were two others cycling just behind him, and a pilot car ahead of him. It was so ordinary a sight; you might have missed him as any young exercise enthusiast but for our guide pointing him out. Two weeks ago, he visited Kolkata -- the sea port is very vital for landlocked Bhutan, the `nearest' other port, Guangzhong, being in China -- and was able to meet with Nobel laureate Amartya Sen, whose books he has read. "I read Amartya Sen's book, The Idea of Justice and was deeply influenced by it." He discovered that Sen was staying at the same hotel as him and they met over tea. "It was a short and a very beautiful meeting. We talked about Gross National Happiness and other things." While in Kolkata, he visited the Kali temple, he said. His sister had told him that whatever you wished for there came true. "At that time I couldn't think of anything to wish for, except that I should come back again and again." Speaking of the Indo-Bhutan relations, the King said, "We are truly blessed because India is our neighbour." Referring to the SAARC summit that was held in his country earlier this year, he revealed that "One of the unstated ideas of the meeting was to showcase the Indo-Bhutan relationship and its warmth and closeness and how the relationship can be a model for the entire SAARC region." The biggest challenge before the young King is to oversee the successful transition of his country to democracy. Since Bhutan became a constitutional monarchy in 2008, he is no longer the executive head but is highly revered and is seen as a unifying force in the country. Speaking of this transition -- the first government elected in 2008 has already completed two and half years -- he told the Indian group, "It initially started under my father's leadership. We have to become a mindful democracy. Right now we are a learning democracy. Much will depend on how we respond (to challenges). There are other types of democracies -- struggling and failed -- as in some other countries of Asia." He spoke at length about the GNH which was adopted by Bhutan as state policy to create an environment for its citizens to be happy, in place of the GDP. The King said, "Our focus is on democracy, and on economic and human development. The world has grown so much economically but for us it is very necessary that development is sustainable. Unsustainable development is not our goal. Unmindful consumption is the biggest problem of the world today." He emphasised the importance of the 'institutional memory' as 'we move forward'. "I spend a lot of time with my senior officers because they have an institutional memory. We have to learn from them and not (rely) only on fancy degrees." And added, "We have to balance the youth's energy with the wisdom of old age." Speaking of his father, who is greatly revered in Bhutan, the King said, "He is not only a workaholic but also a perfectionist. He was wise and systematic. He had been king for 34 years but he foresaw that democracy was the way ahead and the paved the way for it." On whether his father guided him in the day to day affairs of state, the King said, "He says you are you and you need to learn how to navigate. Once you decide that everything is a means to an end, everything becomes easy. For every decision you must see what will bring happiness to the people." What was it that he found most rewarding and what did he find most difficult? All through the King spoke with ease and candour, which was disarming. He said he found "the times spent with my father, like talking about the day" to be rewarding. He also valued his travels throughout the country, "when I meet with and stay with people". He described an instance when he had cooked for them. Later, one of his aides recalled how he had 'cut onions' when he had stopped at a school and cooked for 70 students. And what did he find difficult? "The last 45 seconds before taking a decision." Even though Bhutan is not a densely populated country -- it has a population of only 7 lakh -- urbanisation in places like Thimpu had begun to pose problems, with instances of petty crime. "When an area is densely populated, there is more confrontation because there is anonymity. On the other hand, it is different in rural areas "because everyone knows everyone else." Did he see Hindi films? If so, which were his favourites? "Three Idiots," he replied instantly. Of the Bollywood actors, he liked "Amitabh Bachchan, because I have grown up seeing him. Aamir Khan is very talented. As for Shah Rukh Khan, when you see his movie, you know you are going to enjoy it." What about the women actors? His favourite Hindi song, he said, was "Kabhi kabhi mere dil main khyal aata hai." He enjoyed Indian food and liked "gulab jamuns, kebab roti and also South Indian food, like dosa and idli." How did he manage to stay so fit? The King said he loved to exercise and did 20 kms of cycling everyday at 5.30 am and also lot of trekking. If he had not been King, what would he have liked to become? "A teacher." Youngsters asked questions all the time and "we keep growing with them". He said he would like to retire in 20 years time, though under the new constitution the King retires and makes way for his heir at the age of 65, which means that he has another 35 years to go. "By then (in 20 years) democracy would be well established in Bhutan. If it is not, it will be my failure. If it is, I will have no role to play." He was asked the secret of his being able to remain so cool at such a young age. The credit, he said, "goes to my parents. My father is a good mentor. It is a combination of nature and nurture, which has made me cool." The King has a way to put people at ease. He sat not on his throne but on another seat facing us. At the end of the meeting, he suggested, "How about a group photograph?" An official photograph was hurriedly called in and he took photographs. He admitted that he was "a romantic". "I write a diary though it is not meant for public. I want to remember people and places. When I go on a trip, I bring a menu card of a nice dinner I have had or a souvenir to remind me of a place or a person. When I went abroad, I took with me a bit of the Bhutanese soil." He was viewed as one of the most eligible bachelors today? "May not be for so long," the King replied enigmatically.